The Rainiers lost their third straight game in Fresno on Friday night by a score of 9-3. And I’m blaming the losing streak on too much sleep. No problem though – after three straight nights of 10+ hours of sleep for anyone who wanted it in Fresno, we’re rejoining what I like to call the No Sleep League. Friday’s loss ended around 10:00, and most players were back at the hotel around 11:15 or so. The team then had 3:45 AM wake-up calls, for the 4:30 am bus to the airport and the flight back to Tacoma. Flying commercial, there is only one flight a day from Fresno to SeaTac that will get us home in time for the game, so we gotta take it – no matter how inconvenient it is. We did arrive early enough this morning for the boys to get some nap-time in before tonight’s game, so that’s good. So the Rainiers had virtually no sleep last night, play a night game tonight, and then a day game tomorrow – that’s another short-sleep night. After a good night’s sleep Sunday night with a night game on Monday, the Rainiers play at 11:30 AM on Tuesday – another short-sleep night – and then, after Tuesday’s day game, take a red-eye overnight flight to Iowa to start an eight-game road trip. This is going to be a bleary-eyed group by the time we get to Des Moines. But in the PCL, it’s all about overcoming obstacles – and the Rainiers have plenty of obstacles to choose from right now. Three-game losing streak? Check. Dwindling lead in the standings? Check. Two starting pitchers lost from the rotation? Check. Key players battling injuries? Check. Kid from rookie ball starting a game in a Triple-A pennant race? Check. Yup, that’s right. Ryan Feierabend was supposed to pitch tonight, but he hit the disabled list with a strained muscle in his rib cage. So instead we are going to start 21-year-old Yoervis Medina, whom you might know was the opening day starter for your Everett Aqua Sox. Yes, your short-season rookie-ball Everett Aqua Sox – four steps below Triple-A on the minor league ladder. Now, reports are that Medina has good stuff. He’s 3-2 with a 4.20 ERA for Everett, and with 48 strikeouts and 15 walks in 40.2 innings. But this is Triple-A – it would be a shock if he has a successful outing here. Medina is going to make this one fill-in start and then presumably return to Everett. The Mariners will make all of the appropriate moves to solidify the Rainiers starting rotation – they were just caught in a bind for this one game due to the unexpected injury, and the kid is gonna fill in. Hopefully Medina will throw strikes and survive for four or five innings. Tonight’s game is at 7:00, and it’s the opener of a four-game home stand. Reno is scheduled to start RHP Kevin Mulvey (5-6, 5.11). Mulvey beat the Rainiers with an excellent outing after the all-star break. It’s a TV game on Comcast Sportsnet Northwest – channel 179 on most Comcast Digital systems. The simulcast will air on 850 AM and stream via www.tacomarainiers.com. Bucky Jacobsen will be joining me in the booth. ROSTER UPDATE: Here are all of the moves today. Tacoma was two players under the max before today, because of French’s call-up and Feierabend’s move to the disabled list. That fills Tacoma’s roster at 24 men. The starting rotation for the homestand is today: Medina, Sunday: Petit, Monday: Pineda, Tuesday: Beavan. Here is my Rainiers game story from last night’s 9-3 loss. The Rainiers are 18-9 in July. Here are some notes from the Fresno perspective. Larry LaRue gives a little taste of what its like to be a player at the trade deadline – using Luke French as an example. The Mariners are making costly defensive mistakes. Former Rainiers catcher Jim Horner resigned as manager of the Mariners Class-A High Desert affiliate, accepting a job at Texas Tech University. Horner made the move for his family. Dave Cameron says don’t give up on Justin Smoak. I can’t even begin to cover all of the deadline trades here; but if you want a one-stop shop with analysis this is a great place to go. Also, CBS Sportsline is my favorite one-page MLB scoreboard, and their transaction list is usually more current than ESPN and others. Hey check it out now – Jeff Clement got recalled by Pittsburgh! Round Rock released former Rainiers slugger Tommy Everidge. He certainly had a strange season. On the field in the PCL, Salt Lake missed an opportunity to gain a game on the Rainiers. Tacoma still has a five-game lead. Fresno still leads Sacramento by one game in the South. The Grizzlies are serious about winning. Josh Donaldson homered for Sacramento, keeping up the pressure. Current Tacoma opponent Reno lost at home to Las Vegas last night, 12-9. Vegas scored nine runs in one inning, and JP Arencibia hit his 30th home run. Apparently my post about sleeping in Fresno got the attention of a Fresnan. Fun stuff! I like Fresno, and I like sleeping – I’m well rested right now, thank you! I mean really – how can you be stressed when you have a five-game lead, and you’re getting 10 hours of sleep every night in Fresno? The Rainiers have lost two in a row after Thursday night’s 6-4 loss at Fresno, and Salt Lake is hot – they’ve won 10 of 12 games to narrow the gap down to five. The Rainiers had a nine-game lead on the morning of July 16. Tacoma is neither hot or cold right now – the Rainiers have gone 8-7 since the all-star break, while playing 11 of those 15 games on the road. Salt Lake has been loading up on wins while facing a bad Portland team – and they have six more games against the Beavers, right in a row. Salt Lake and Tacoma do not play each other again this season. The Rainiers continue to play on the road for the next two weeks – there is a four-game series at home against Reno Saturday through Tuesday, but then they hit the road for eight games. All told, Tacoma plays 20 of 28 games after the all-star break on the road. But then things change – the Rainiers finish the season playing 17 of the last 25 games at home, including five against Portland. The schedule balances out. The final game of the four-game series in Fresno is tonight at 7:05, and the Rainiers need a win to salvage a split. Tacoma sends RHP Ian Snell (3-2, 4.58) to the mound against Fresno RHP Kevin Pucetas (2-6, 6.12). The game will be broadcast on 850 AM and streaming online via www.tacomarainiers.com. The Rainiers starting rotation is in a state of flux right now, and we still don’t know how it’s going to shake out. First staff ace Luke French was called up to Seattle, and now I have learned that Ryan Feierabend will miss his scheduled start on Saturday against Reno, due to a strained ribcage muscle that may land him on the disabled list. The Mariners to going to have to send in reinforcements soon – Tacoma could potentially get a starter back from Seattle when Shawn Kelley comes off the disabled list, and there are a couple of candidates for a promotion in Class-AA. Injuries are mounting. Outfielder David Winfree has missed two games with a strained quadriceps, and he is day-to-day. Catcher Adam Moore got smoked on the left forearm by a pitch yesterday, and he took a beating on foul tips behind the dish – look for Eliezor Alfonzo to start tonight. The News Tribune hired an excellent writer to ink the Rainiers game story from last night’s action. It was definitely strange to see Andy Baldwin walking hitters. Our own Michael Pineda snuck onto Baseball America’s Prospect Hot Sheet – complete with a nice shot of the Pineda rookie card. I was chatting with Pineda’s agent Dan Evans the other day, and he and I agree that Pineda is an extremely under-rated prospect nationally. The pitchers called up by Seattle from Tacoma all struggled in unison last night in Chicago – they had been performing quite well. I’m not sure what this Long Geoff Baker Post is about, but it sure is long. Dave Cameron did a nice job explaining why the Mariners don’t really have a trade deadline. Here is something called a “Prospect Smackdown” between our own Dustin Ackley and the Brewers’ Brett Lawrie – brother of the UW softball star. Former Tacoma Giant Willie McCovey is rooting for a rookie to break one of his records. The “Moneyball” movie is filming, and yesterday they shot a scene involving Gig Harbor’s own “Pickin’ Machine” – Scott Hatteberg. In the PCL, Salt Lake won its sixth in a row to pull within five games of Tacoma. But the Bees lost a key hitter when Cory Aldridge landed on the disabled list. Sacramento got knocked into second place by the Sky Sox. In this story: a rash of injured national anthem singers in Sacramento. I’m glad were leaving Fresno – the Buster Posey bobblehead frenzy sounds terrifying. Oklahoma City’s Michael Kirkman is quietly having a great season. Well – maybe not so quietly anymore, he does show up on the Hot Sheet. I thought about writing today’s main item about the trade deadline, and player’s reaction to it. But with the Mariners so quiet this year, let’s save that for next season. One thing is for certain: I’m glad RG’s can’t be traded! Michael Pineda is turning into the “no run support” guy. For the second start in a row, Pineda allowed one run, only to see the Rainiers eventually lose the game, 2-1. Pineda got in trouble right away on Wednesday night, drilling the leadoff batter with a pitch. Emmanuel Burris then stole second and went to third on an error, so he was at third base with nobody out. Pineda worked through that jam, escaping the first with no runs scoring although it took him 25 pitches. Pineda was great after that, only allowing a solo homer to veteran slugger Joe Borchard in the fourth. It was a high change-up that Borchard lifted over the fence in left for an opposite-field homer. Pineda made it through six innings on 86 pitches. The Mariners continue to keep him between 85 and 95 pitches per start; as they do not want to tax his 21-year-old arm. Keep in mind that Pineda was injured for most of 2009 with elbow problems that did not require surgery – the Mariners are being very, very careful with him. When Pineda left the game it was 1-1. The Rainiers just can’t hit Fresno lefty Matt Yourkin. Yourkin has made three starts against the Rainiers, allowing exactly one run in each outing. Fresno finally won the game in the tenth against reliever Levale Speigner. Ben Copeland led off with a single to center field, and he took second on a passed ball. Steve Holm bunted up the third base line, and Speigner tried to get the out at third but Copeland was safe. Burris followed with a grounder inside the third base bag to drive in the winning run. Mike Carp went 0-for-3, ending his hitting streak at 17 games. Matt Mangini, however, had his hitting streak extend to 17 games under unusual circumstances. Mangini hit a grounder between short and third in the sixth inning, and shortstop Burris made a running backhand attempt, only to have the ball bounce off his glove. The play was originally ruled an error on Burris, but after the game it was changed to a hit – which I believe was the right decision, and both managers agreed. So Mangini’s hitting streak is alive. Salt Lake trimmed Tacoma’s lead down to six games by beating Portland, 8-3. The Bees have seven more games against last-place Portland, right in a row (there is a makeup doubleheader in there that I just learned about). The Rainiers lead looks good with 39 games to play, but Salt Lake has an easy schedule right now. The Bees have won nine of their last 11 games. Tonight’s game is at 7:05, and Tacoma starts RHP Andy Baldwin (7-4, 5.00) against rehabilitating San Francisco Giants RHP Todd Wellemeyer (0-0, 0.96). Wellemeyer was the Giants fifth starter; he’s been out since June 10 with a quadriceps strain – and in the meantime, Madison Bumgarner took his job. Baseball can be a cruel business. You can catch the broadcast on 850 AM or streaming via www.tacomarainiers.com. Here’s the Rainiers game story from The News Tribune. Here’s the notebook from the Fresno Bee, and a story about Fresno’s starting pitching woes – which were clearly not evident last night. The Mariners lost in Chicago when Jason Vargas had a rare problem with home runs. In today’s Long Geoff Baker Post, Geoff Baker writes that the Mariners could trade David Aardsma. Larry LaRue says you won’t be overwhelmed by any Mariners trades. The renovated Cheney Stadium will host the state 3A and 4A high school baseball championships next year. In the PCL, Salt Lake leadoff man Peter Bourjos is hotter than a pistol right now. But really, the whole Bees team is heating up. The Reno Aces got to experience a bullpen day gone right. Veteran infielder Ed Rogers is the glue that holds the Reno Aces together. Las Vegas lefty Brad Mills got called up to Toronto, shut out the Orioles, and was shipped right back to Vegas. When your leadoff man bats twice in the first inning, it’s a good sign. When he hits a grand slam in his second at-bat, it’s a great sign. Cameron Maybin did that yesterday for New Orleans. Same game, different paper: headline reads “Nine-run first trips Redbirds.” Trips? Really? Isn’t a nine-run first more like a punch in the mouth? Derek Holland had an excellent rehab start for Oklahoma City. The only hit he allowed was a home run to Chris Shelton. Sleeper prospect Mitch Moreland homered and then got called up to Texas. Portland owner Merritt Paulson publically stated that he is selling the Beavers so they can move out of town. Former Rainiers outfielder Scott Podsednik was traded from Kansas City to the Dodgers, taking his .310 batting average and 30 stolen bases with him. Another former Rainier – Wladimir Balentien – is on a home run binge for Louisville. Balentien has six homers in his last nine games, and 20 on the year. I leave you now with a nice picture of my lunch – with special thanks to Doug Greenwald, who was kind enough to pick me up and take me there. When I first started working for the Rainiers in 1999, I absolutely loathed the Fresno trip. It was always 100 degrees and smoggy. The ballpark was worse than a Class-A stadium, with no broadcast booth and no air conditioning anywhere. The hotel was 20 minutes away, in a completely decrepit downtown area. The whole thing made me miserable – not to mention sweaty, stinky & gross. 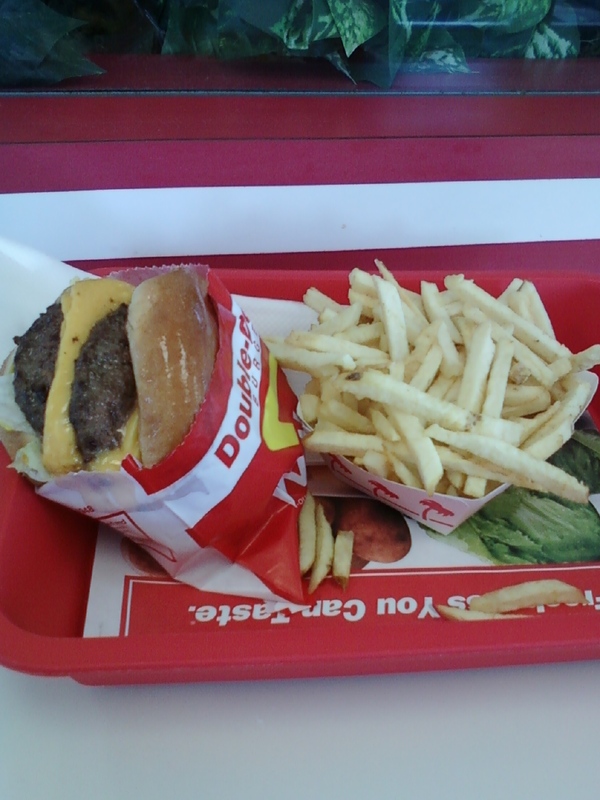 Several years later, I came to appreciate the Fresno trip. First of all, after years of starts and stops, they finally opened their new downtown ballpark – and it’s a great facility, one of the top six or seven in the league. The hotel is strong, and you can walk to the park. We’re still in downtown Fresno, and it’s still kind of decrepit – but not as decrepit as it was 12 years ago. It’s still a hundred degrees and smoggy every day, but I have learned how to counter that: by sleeping. Here’s the point: there is nothing to do in Fresno, except go to the park and work. It’s too hot and smoggy to walk anywhere, and there really isn’t anywhere to walk to anyway. Like virtually everybody else, I have no friends or family members to visit with in Fresno. There is no nearby post-game bar scene to get caught up in. This is, in a word, a great trip for sleeping. It’s a fantastic place to rest up, regain some energy, and recharge for the final month of the season. So that’s the focus. Rest up, finish some projects I have with me, call the games, write the blog, all from the air-conditioned bliss of my hotel room. I’m also going to undertake a thorough study to determine exactly what my sleep number is. OK, back to baseball: the Rainiers came away with an unexpected win yesterday, overcoming a difficult obstacle to pull off a surprisingly easy 9-3 victory in the opening game of the four-game series. It was an unexpected win because Rainiers ace Luke French was scratched an hour before the first pitch, forcing the Rainiers to use Yusmeiro Petit for a spot-start. Petit had pitched 1.2 innings the day before – he was working on zero days rest, as a starter. I expected him to last about two innings. Petit ended up going five innings, as the Rainiers built an early 8-1 lead and coasted to the win. Mike Carp (17) and Matt Mangini (16) each extended their hitting streaks. Greg Halman homered and tripled; he had four RBI. The Rainiers have won six of the last seven games, and they still have a seven-game lead over second place Salt Lake. Today is Michael Pineda Day. The big kid is 3-1 with a 3.71 ERA; he starts against Fresno LHP Matt Yourkin (6-4, 3.74). Game time is 7:05 pm, and the broadcast will be on South Sound Sports 850 AM, and streaming via www.tacomarainiers.com. French did get called up to Seattle – the M’s put Ryan Rowland-Smith on the disabled list with ERA back problems. I’m guessing we’ll see RRS for some rehab outings in Tacoma and then he’ll get activated on Sept 1. Here’s my Rainiers game story for The News Tribune. Obviously, I focus on Yusmeiro Petit’s outing. Manager Daren Brown said he was “tickled to death” by it. Good thing Griffey retired, or we might have a death by tickling! Here are the game notes from the Fresno perspective. Geoff Baker compared Rowland-Smith’s game last night to some of the most lopsided sporting events in history. I’ll admit it – it made me laugh. In this Long Geoff Baker Post, he compared the Mariners offense to some of the worst in baseball history. Looks like Shawn Kelley is very close to returning to the Mariners bullpen. My pal Rob Neyer says move Ryan Rowland-Smith to the bullpen, where he has had better success. Dave Cameron agrees. Ex-Rainiers pitcher Gil Meche is going under the knife. This is his second shoulder surgery; I wish him the best. That’s going to be tough to come back from. Everybody is talking about the Portland Beavers move to San Diego North County except for the Portland Beavers. Phillies prospect Trevor May – out of Kelso High School – struck out 14 batters last night. He’s highly regarded by scouts. Also in that link – M’s class-A second baseman Kyle Seager extended his hitting streak to 32 games. The City of Peoria (Arizona) is looking at upgrading the Mariners and Padres spring training home. On the field in the PCL, Salt Lake won again last night – but you sense some frustration that they have won 8 of 10, yet are still seven games back. Slugger Paul McAnulty was surprised by his recent stint in the major leagues. Sacramento took a one-game lead over Fresno in the South, thanks to a great pitching performance from Boof Bonser. * The RiverCats appear to have home field advantage in the playoff race. Reno slugger Brandon Allen is on a Crazy Man-Tear for the Aces. New Orleans lefty Sean West tossed a complete-game, five-hit shutout in a 1-0 win over Memphis last night. Oklahoma City picked up a win last night, and today they have Derek Holland on rehab. You know what will break up my busy sleep schedule in Fresno tomorrow? A lunchtime visit here. Now that is worth crawling out of bed for. * “Boof Bonser” is almost as fun to type as it is to say! Wait A Minute – Fresno Is Still In The League? We got up before the crack of dawn and flew to Fresno today. After a two-hour nap – one hour in a lobby chair waiting for my room to be ready, and another hour in bed – I realized how weird this is. It’s July 27, the Rainiers have played 102 games, and today we play our first game in Fresno this season. This is a city the Rainiers visit twice each year; it’s weird to have our first visit so late in the season. Tacoma closes the season here over Labor Day weekend. The Rainiers are coming into Fresno hot. The team has won five of its last six games, and the Rainiers 58-44 record is the best in the PCL. Sunday Tacoma beat Sacramento 5-4 in ten innings. Matt Mangini led off the tenth with a double to right, he took third on a passed ball, and scored on Mike Wilson’s long single over the center fielder’s head. Mangini and Mike Carp are streaking. Carp has a 16-game hitting streak, during which he has batted .344 (21-for-61). Mangini has a 15-game streak, and he’s hit .389 during his (21-for-54). The franchise record is 26-games, set by Rex Johnston in 1965 and tied by Chad Akers in 1999. The Rainiers made a roster move today, releasing veteran relief pitcher Joe Nelson and activating Mumba Rivera from the disabled list. Tonight’s game is at 7:05 in Fresno. The Rainiers will start LHP Luke French (11-3, 2.94) RHP Yusmeiro Petit (2-2, 5.91) against Fresno RHP Henry Sosa (6-2, 3.11). The broadcast will be live on 850 AM and streaming via www.tacomarainiers.com. Ryan Divish got demoted to Triple-A, so he wrote the Rainiers game story for The News Tribune. He focused on Mike Wilson. The M’s still might make a trade before Saturday’s 1:00 Pacific deadline. Or maybe they won’t. Geoff Baker wrote a Long Geoff Baker Post about a rumored rift between the Mariners front office and field staff. My take: everyone is always bitter when the team is losing. Larry Stone ranked the Top Five Most Disappointing Mariners Teams In Franchise History. Here is part one of a two-part feature on longtime Rainiers pitching coach Dwight Bernard, who was assigned to Class-A Clinton this year. This Baseball America prospect round-up talks about M’s farmhand Kyle Seager and his 31-game hitting streak at High Desert. I don’t know what in the world is going on with Prentice Redman, but this is just completely unexpected. I hope he gets it together. In the PCL, Salt Lake remained seven games behind Tacoma by beating Colorado Springs last night, 6-1. Sky Sox pitcher Nick Bierbrodt got tired of giving up home runs, so he started throwing at people. Salt Lake has won seven of nine. Here’s the latest on Fresno, who has lost six of eight. The Grizz are still tied in first with Sacramento. New Orleans first baseman Logan Morrison got called up by the Marlins. He’s replacing Chris Coghlan, who got injured in a shaving cream pie incident. Really. The playing surface in Las Vegas is in terrible shape, but the players just have to deal with it. A pair of rehabbers pitched yesterday in the American Conference: Kyle Lohse was good; ex-Rainier Gil Meche was not good. 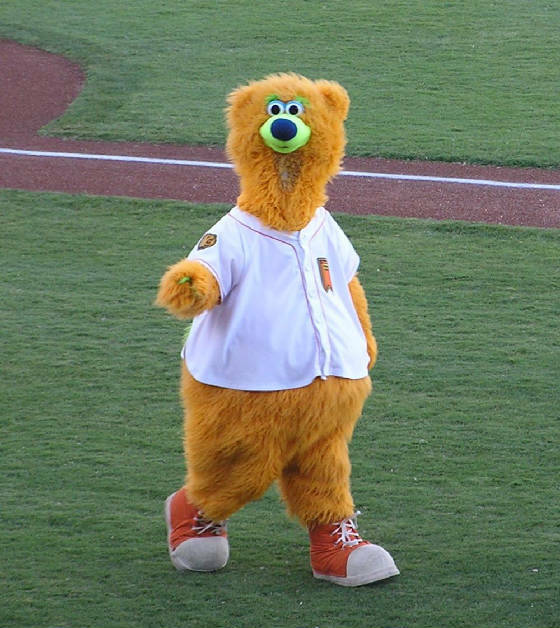 One thing I’m looking forward to in Fresno: seeing this thing, the only mascot in the PCL that actually makes me laugh – and he does it almost every game. Who schedules these 11:30 AM games, anyway? A few quick items while I’m hooked up to a caffeine IV. The Rainiers beat Sacramento yesterday in an exciting game, 3-2. Brett Anderson pitched like the major league #1 starts that he is, commanding his breaking stuff and keeping the Rainiers off the scoreboard until he was lifted at 87 pitches in the sixth inning. Ian Snell almost matched him, allowing one run in six innings. The Rainiers took the lead on Adam Moore’s long two-run homer in the sixth, off reliever Travis Banwart. Moore went 4-for-4 and is hitting .327 in the PCL. Sacramento tied it up on Travis Buck’s deep triple in the eighth, but the Rainiers won it in the bottom of the ninth. David Winfree led off with a single, and Moore singled him to third. Mike Wilson walked with one out, loading the bases. Dustin Ackley – who was enjoying his first day off – pinch-hit for Jeff Dominguez. Ackley got behind in the count 0-2 before lifting a deep sacrifice fly to left field, scoring Winfree with the winning run. Tacoma is now 13 games over .500 at 57-44, and the Rainiers maintain their seven-game lead over a suddenly hot second-place Salt Lake (the Bees have won six of their last eight games, and Peter Bourjos is going off). Today’s game is at 11:30 AM. The Rainiers can take the series with a win. LHP Ryan Feierabend (3-3, 5.25) starts for Tacoma; Sacramento counters with RHP Tyson Ross* (1-1, 3.38). Radio only today on 850 AM. The Rainiers game story from The News Tribune, as composed by the artist Doug Pacey. Pretty much every analyst thinks that this trade was a total fleecing. When was the last time a mid-season call-up from the PCL had this big of an impact on a pennant race? I can’t remember. Buster Posey in July: 432/511/815. In the PCL, the Bees are heating up and Bourjos is nearly batting .500 in July. Here’s a feature on veteran Salt Lake outfielder Cory Aldridge. Portland got medieval on the Las Vegas 51s last night. The Beavers set modern franchise records for runs and hits. Five different players had four or more hits – check out the box score. The Portland beat-down made Round Rock’s 14-2 loss seem close. Reno won when Cesar Valdez tossed seven shutout innings against Fresno, keeping the Grizzlies in a first-place tie with Sacramento in the South. I leave you with more information on the Portland Beavers move to North County (San Diego) in 2011. Andy Baldwin had his finest start of the season on Saturday night at Cheney Stadium, working 6.1 inning and allowing just three hits and one earned run while earning the 6-4 win. Baldwin struck out eight batters while facing one of the top offenses in the PCL. The Rainiers had home runs from Brad Nelson and Mike Wilson while taking an early 6-1 lead, and reliever Levale Speigner survived a rocky ninth inning to put it in the books. Interim manager Scott Stienmann picked up the win, in place of suspended Tacoma skipper Daren Brown. Both Brown and reliever Scott Patterson have served their time and will be back today. Tacoma improved to 56-44 on the year, and the team remains seven games ahead of second-place Salt Lake in the PCL-North. Today’s game is at 1:30, and it will be televised on Comcast SportsNet with the simulcast airing on South Sound Sports 850 AM. Once again Jeff Heaverlo will be joining me in the booth. Tacoma will send RHP Ian Snell (3-2, 5.13) to the mound against Sacramento LHP Brett Anderson (1-0, 6.75) – yes, THAT Brett Anderson, the guy who is the Oakland A’s #1 starter. Anderson is rehabbing “inflammation” in his left elbow; he’s supposed to throw 85-95 pitches. Here’s Gail Wood’s Rainiers game story for The News Tribune. Daren Brown watched on TV and commented afterwards. Thanks for being part of the viewing audience, skipper! I wrote my Sunday minor league notebook about the players picked up in the Cliff Lee trade – non-Smoak edition. The Tacoma Rainiers Seattle Mariners beat the Boston Red Sox last night. David Pauley had a good start, Chris Seddon earned his first major league win, Garrett Olson got his first major league save, and Michael Saunders homered against one of the best lefties in baseball. Way to go Rainiers Mariners! At the Times, Larry Stone wrote his Sunday column about the nature of the trade deadline. He turned in his always entertaining Power Rankings (I like #21). His notebook includes an item on Iowa Cubs manager Ryne Sandberg – we’ll be seeing Ryno on August 4 in Des Moines. In the PCL, Salt Lake remained seven games back by beating the tarnation out of Colorado Springs, 17-1. Yeah, 17-1. Salt Lake has won five of its last seven games. I don’t know why, but the Rockies sent Jhoulys Chacin back to Colorado Springs. So while they might have lost last night by 16 runs, the Sky Sox did welcome back a #1 starter. Chacin has a 4.04 ERA and 89 strikeouts in 82 innings – in the major leagues. Fresno moved back into a first-place tie with Sacramento in the South. You know you’re having trouble scoring runs when you use two squeeze plays in Reno – that place is a launching pad, just swing away for crying out loud. The Reno paper ran a feature entitled “Pitching 101.” There’s actually some interesting stuff in here. Lots of tidbits from Omaha in here: top prospect Mike Moustakas is heating up, and ex-Rainiers pitcher Gil Meche will make a rehab start on Monday. Sorry for the short blog today – and probably another shorty tomorrow; we have an 11:30 AM game on Monday. You are currently browsing the Booth, Justice and the American Pastime blog archives for July, 2010.